When your kids are little, you pretty much know what they think about you. Two thirds of the time they love you, and one third of the time, it's pure hate. And that's usually after you said no to something they felt was urgent. But they always believe that you know what's best for them, and for you. When my daughter Hayley's father left me some years ago, I lost a lot of confidence. I thought I'd be married forever--I loved being a wife and mother – and a fabulous cook on the side. It's taken time to gain my confidence back and figure out my passion. Big surprise? No! It's food and cooking. And I've loved seeing Hayley turn into a foodie too. I so admire her work at Key Zest and her tenacity in getting and holding her food critic job. But did I ever see myself with another man? Not at all. Hayley thinks I'm crazy. She thinks it's so easy – I've got a great guy, I should hang on for all it's worth. But I'm not so sure. I'm terrified that I would lose myself in a relationship again and then I'd be starting all over. What do you think? Can a woman be her best, strongest self and still be in a relationship? PS Great news! 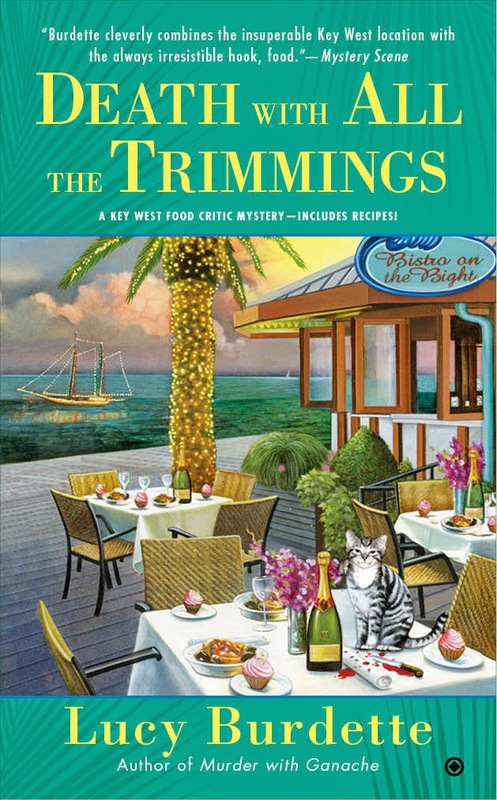 A goodreads giveaway is now running for Lucy Burdette's fifth food critic mystery, Death with All the Trimmings, on bookshelves December 2. You can pre-order it now! A woman HAS to be her best, strongest self when in a relationship. Love the cover Lucy/Roberta and looking forward to this next installment! Thanks for the heads up on the goodreads giveaway!